Open City Cinema and Video Pool are teaming up to present a program exploring Feminist Video Art, and the culture of Independent Distribution of Video Art in Canada. 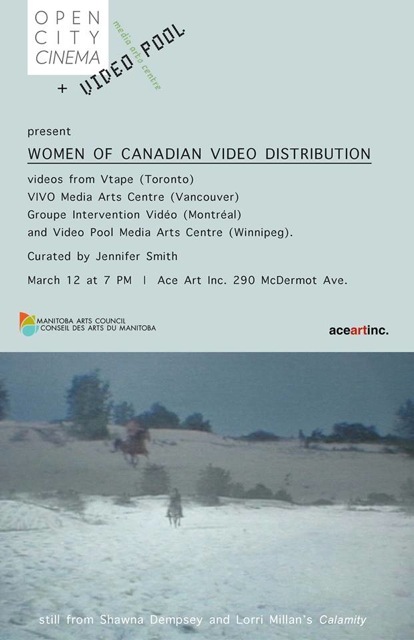 The four independent Canadian distribution centres across Canada are Vtape (Toronto), VIVO Media Arts Centre (Vancouver), Groupe Intervention Vidéo (GIV) (Montreal) and Video Pool Media Arts Centre (Winnipeg), curated by Video Pool’s Jennifer Smith. Presented with support from The Manitoba Arts Council/ Le conseil des arts du Manitoba and aceartinc.